AirTurn MANOS Tablet stand bracket Locking arms and spring-loaded fingers ensure a simple yet.. The HERCULES Trumpet/Cornet Stand DS510BB features a velvet instrument peg and solid swivel legs f..
210/6 MICROPHONE STAND - black Modern update of the classic 210/2. 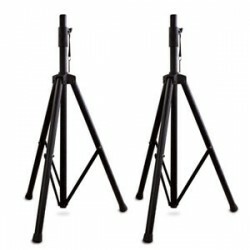 Zinc die-cast ba..
21459 SPEAKER STAND PACKAGE - black 2 x K&M Speaker Stand 21450 in a Carrying C..
19740 Tablet PC holder - black A distinctive tensioning mechanism means this holder is suitable f..